In advance of Big Boi’s second stand-alone solo album, VICIOUS LIES AND DANGEROUS RUMORS, arriving in stores December 11th on Purple Ribbon/Def Jam Recordings, Diamond-selling, seven-time Grammy Award®-winning General has released a new single to overwhelming critical reception, “Mama Told Me” featuring fellow Grammy®-winner Kelly Rowland. 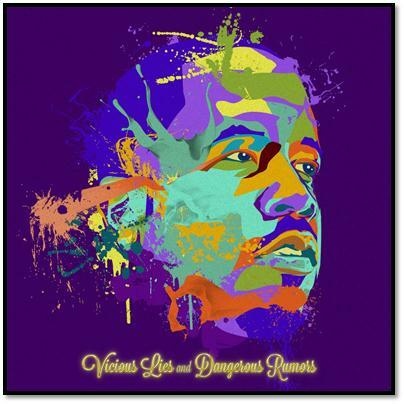 VICIOUS LIES AND DANGEROUS RUMORS is Big Boi’s long-awaited follow-up to Sir Lucious Left Foot: The Son Of Chico Dusty, his first stand-alone solo album, released July 2010 on Purple Ribbon/Def Jam. The album spun off Big Boi’s first Def Jam single, the Top 15 R&B hit “Shutterbug” featuring Cutty, produced by Scott Storch. Big Boi (Antwan André Patton) made history with OutKast from their debut, Southernplayalisticadillacmuzik (1994, recorded when Big Boi was still a teenager) to their 2003 swan song, Speakerboxxx/The Love Below. The landmark double-CD, their 5th studio album, containing solo albums by Big Boi and his partner André 3000, respectively. One of the biggest-selling hip-hop albums in history – 11-times platinum in the U.S., over 15 million worldwide – Speakerboxxx/The Love Below generated three Grammy Awards® (including Best Rap Album and Album Of the Year) and spun off two life-changing #1 hit singles, André 3000’s “Hey Ya!”and Big Boi’s “The Way You Move” (with Sleepy Brown).